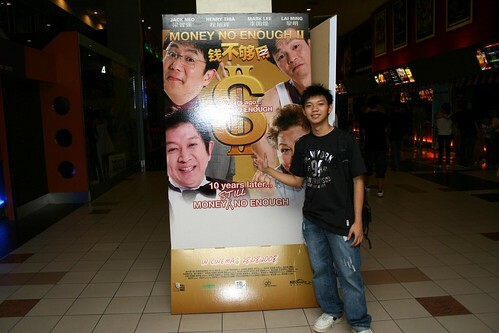 I have went to the cinema to watch Money No Enough 2 last weekend. Malaysian Chinese loves Singapore’s movie because of its craziness, humorous and educational plotting. Salute Jack Neo and fellow Singapore’s Chinese film’s producer. 10 years ago, there’s a Singapore hit Chinese film and that’s Money No Enough, everybody had a great laugh on that movie. I don’t really remember the story about that movie although I had watched it before, I was very small that time. It’s back now, went to watch it and I like it. The whole theater was full. I didn’t laugh a lot, but it’s funny at some part of the movie but I just can’t laugh it out like others did. Jack Neo is getting into a trend of producing movie that is comedy and educational. His movies are like can laugh you out and also touched your heart. I could see tears coming out and yes, I was touched by the story at some part with the saddening background Hokkien music playing along. It will be nicer watching it with your family. I recommended the movie though, the previous one is more funny but this is more touching. Watch it in the cinema or not it’s up to you, it’s not really a big hit, perhaps you can wait for the DVD.